On Tuesday night, I was able to take some time to go and have dinner with a friend. I very rarely take a night just for myself and do something with someone else outside of my family or other families... Usually if it is "Emily alone in the evening time" it is Dream Dinners, and therefore totally solo. Tuesday night, I took Addie home to the house and then drove back to where my office is (well, generally) for a girls dinner/date night with a friend. 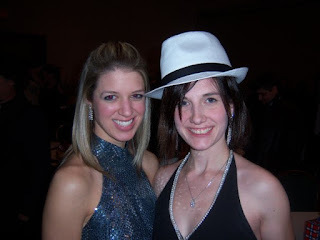 Here we are 6 years ago at a party/fancy dinner. Obviously, we still look the same. It took us a while to come up with what we wanted for dinner, but I am super glad to have been able to spend additional time with a friend. It often feels as though I am not able to do this as often as I might like to. And I need to work on that because spending time with other women that I love and admire, like Shay, is incredibly helpful and beneficial. And I need more strong women in my life, who doesn't? So thank you Shay, for a lovely evening, for inspiring me with your stories, goals, and vision. I love you and look forward to more!